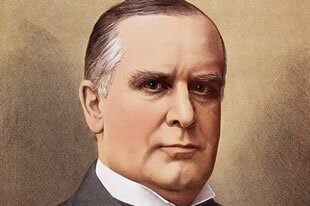 Few Presidents were as genuinely considerate as William McKinley. William McKinley (1843-1901) was one of seven children born to an Ohio iron-worker and his wife. They were poor, devout Methodists, but firmly focused on their children’s education. Thus, when he was seventeen young Billy went to college, but became ill and had to withdraw. Before he could recover and return to school, the Civil War had begun, and the young man enlisted. He remained for the full four years. General Rutherford B Hayes was McKinley’s lifelong mentor. 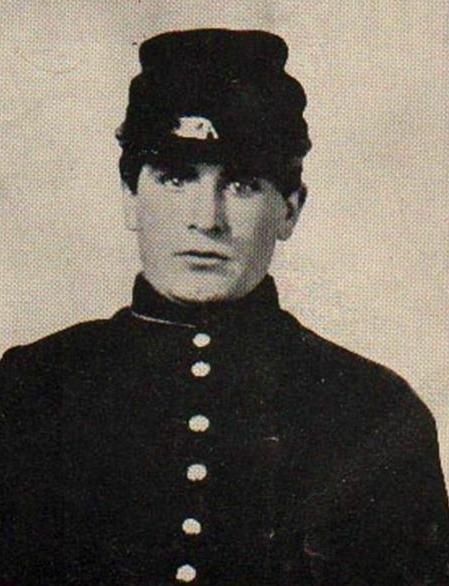 During his time in the Union Army, McKinley rose from private to Brevet Major (on-the-field-promotions), and had come to the attention of his commanding officer, General Rutherford B. Hayes. The friendship between the two would be lifelong. It was Hayes who suggested that his young friend study law. McKinley took the advice once the war ended, became an attorney, and moved to Canton, Ohio, a growing town with opportunities. Affable and congenial, he joined all the fraternal organizations in Canton, plus the Methodist Church and the Republican Party. He was popular, and established attorneys were pleased to refer clients to the young novice. At twenty-seven, he married Ida Saxton, the well-to-do daughter of the town banker. They adored their new son-in-law. Everybody was happy. For four years, William and Ida McKinley were happy. His law practice was thriving; they had numerous friends among the young set; they had a little girl and were expecting another baby. But Ida’s second pregnancy was difficult. Her mother died. The baby was born sickly and died within weeks. Ida’s own health was wracked by painful and debilitating phlebitis, which left her lame. She also developed epileptic seizures. Her little girl died before her fourth birthday. All in the space of a year. Ida understandably suffered a severe depression, which, when paired with her physical ailments and the powerful medications she required, lasted in varying degrees for the rest of her life. She developed an extremely narrow focus; her life revolved around herself, her husband, and their life together. In part to escape from their painful memories, and in part to give them both a change of scenery and opportunities, McKinley ran for Congress, won, and moved to Washington DC. They took apartments in the Ebbitt House Hotel, since Ida could not manage housekeeping. And, at great expense, they hired a full-time nurse-companion, since she couldn’t not be left alone for long periods of time. William McKinley was a good Congressman, with a solid reputation for diligence and common sense. Tariff issues became his realm of expertise, and while it did not generate headlines, it generated respect among his peers. He was a well liked legislator, and made dozens, if not hundreds of friends. They quickly learned that if he was not in his office, or on the floor of Congress, he was home with his invalid wife. That devotion, along with his genuinely good nature, earned him their affection. McKinley served in Congress for seven terms, followed by four years as Governor of Ohio. In 1896, he earned the Republican nomination for President of the United States. He won handily. Ida McKinley, being a wealthy girl-to-woman, had the expensive tastes of a pampered daughter. With her life so curtailed by physical and emotional infirmity, her doting husband was happy to indulge her in whatever way he could. She was pretty with a petite figure and loved fine clothes made from fine fabrics. Her indulgent husband bought her whatever clothes she wanted. She loved diamonds. He bought her diamond necklaces, bracelets and rings. Roses were her flower of choice, so fresh arrangements of roses were placed in whatever rooms she occupied. That included the White House. 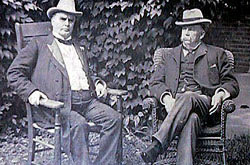 McKinley and VP Hobart. It is a rare photograph of him wearing a carnation. He, on the other hand, had developed a personal trademark of wearing a carnation boutonnière. It was Ohio’s state flower. Sometimes he wore white ones; sometimes red ones. As President, bowls filled with red and white carnations were conspicuously placed in whatever rooms he frequented. One of McKinley’s winsome little customs was to remove his lapel carnation and offer it to guests as a souvenir, or to give to an absent wife or mother or child. Then he would replace his boutonnière with one from the handy bowl. 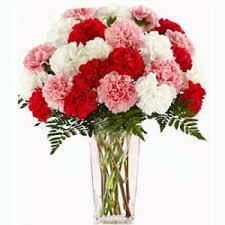 McKinley was superstitious about these carnations, believing them to bring good luck both to him – and to the recipient. President McKinley always wore his signature carnation when he was traveling and likely to meet many people. His aides, knowing his habit, made certain that several dozen flowers were on hand. The story goes that in September, 1901, when McKinley visited the Pan American Exposition in Buffalo, NY, he wore his usual boutonnière. A one-hour meet-and-greet with the general public was scheduled, and on the dais, was his ubiquitous bowl of replacement carnations. Toward the end of the hand-shaking reception, he offered his carnation to one of the visitors. Rather than immediately replacing his flower however, he moved the line along quickly. He would replace it when the reception was over. Only minutes later, one of the visitors waiting to shake hands was Leon Czolgosz, who pumped two bullets into the carnation-less President. This entry was posted in A POTUS-FLOTUS Blog, William McKinley and tagged American history, Feather Schwartz Foster, First Lady Ida McKinley, history, Ida McKinley, Ida McKinley's health, Leon Czolgosz, McKinley assassin Czolgosz, McKinley's carnations, President William McKinley, Presidential history, Rutherford B. Hayes, US history, White House history, William McKinley. Bookmark the permalink.